Of course, I’ve commented before on how the issue of Artificial Intelligence tends to get overdone in popular media recently, where most of the time it is presented as something negative (though really, Hollywood can’t seem to make up its mind there). In Chappie, however, this is not necessarily true, although the film raises quite some ethical questions and leaves you fairly uncertain about the whole issue, especially after its, admittedly brilliant, final twist. When Chappie’s programming is changed, he starts out as a child-like being unable to comprehend what is going on, and he is as impressionable as any child would be. At the same time, he is also far more intelligent and quicker in his development, and his association with a group of gangsters who intend to use him to commit crimes is probably not the best influence on his personality. Then again, what is? 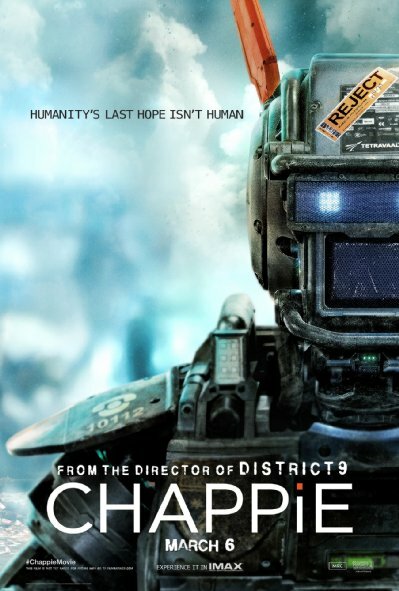 Within the matter of a few days, Chappie’s mind grows up; he learns valuable lessons about life and people, about love and death, and about the general cruelty of the world that he lives in. Only his ‘mommy’ Yolandi (Yolandi Visser) takes him and his emotional capabilities really seriously at first, resulting in a few heartwarming, emotional scenes as we see him understand the world. A robot more human than the humans? Sadly, apart from Chappie himself, the rest of the characters seem rather flat, the storytelling is not as intricate as it could or should have been, and after a while the movie turns into a chaotic, violent piece that tries too hard to be funny, and ends up being rather ridiculous at points. While it still has quite some powerful moments, especially at the end, its implications are not as deep as the subject would require. Indeed, apart from Chappie and Yolandi, I did not quite come to care about any of the characters – and Vincent, who clearly just has issues (don’t they do psych tests in those companies?? ), could have been a good villain, rather than a grown man who appears to basically just throw a tantrum with some badass weapons (and that, I have to say, he did well – props to Hugh Jackman here). It was sad seeing how all that potential was simply not used. Now, for anyone who has seen a science-fiction movie, ever, there are certainly some clichés that the film just throws at you, and while it might be easy to ignore them for the most part, hoping that something great will yet come out of it, some just make you shake your head, wondering about the amount of research that went into it. Of course we have the almighty programmer, whom we see just change a few lines of code (alright, lots of Red Bull is needed to write those lines) and – tadaa! –, we have a sentient robot. And then, oh my, we get a brief sequence of uploading consciousness, which could have been powerful if it hadn’t been so full of logic holes that you could see right through it. Setting Chappie’s character development within just a couple of days felt over-ambitious and unrealistic too. Still, Chappie ended up being emotionally compelling. ← What’s with the Assassin’s Creed stuff?